Aside from learning that IMDb is owned by Amazon (it's true apparently! Learn something every day), there are no real surprises here. The specs are passable, but nothing extraordinary. It's unspecified just which dual-core Snapdragon this is, but this should be adequate for most budget-conscious users' purposes. 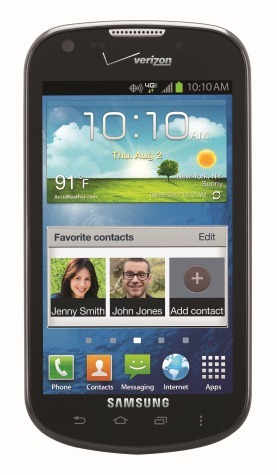 The Galaxy Stellar will be available starting on September 6th from Verizon. BASKING RIDGE, N.J., and DALLAS – Verizon Wireless and Samsung Telecommunications America (Samsung Mobile) announced today that they will offer the exclusive Samsung Galaxy Stellar™ starting Sept. 6 in Verizon Wireless Communications Stores and online at www.verizonwireless.com. 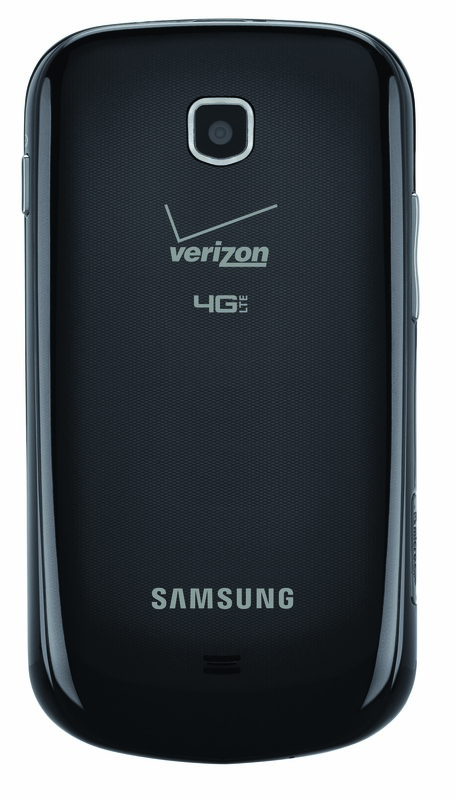 The easy-to-use 4G LTE enabled Samsung Galaxy Stellar is designed to be compact so it fits easily in a customer’s hand and makes the first-time smartphone experience simple. The Stellar features a dual interface option so customers can choose between Starter Mode or Standard Mode. Starter Mode features a simplified home screen display with preset widgets such as Favorite Apps, Favorite Contacts and Favorite Settings for quick and easy access to frequently used apps and settings. Starter Mode also features a quick dialer icon that allows customers to make phone calls directly from the home screen. Standard Mode provides customers with a more conventional layout and gives customers the traditional Android™ experience. The Stellar also includes a Help app that features guided tours and tips for changing settings and more, so customers can master their devices. Samsung Galaxy Stellar customers can take advantage of blazingly fast 4G LTE connectivity to access an array of convenient and multimedia rich apps. A suite of Amazon apps is included that offers customers easy ways to discover content such as watching movie trailers on the IMDB app, downloading audio books with the Audible app, and one-click ordering with the Amazon shopping app. The Stellar also offers a variety of premium TV and film content for rent or purchase through the Samsung Media Hub. The Galaxy Stellar is a SAFE™ (Samsung Approved For Enterprise) approved device featuring on-device AES 256-bit encryption, enhanced support for Microsoft Exchange ActiveSync® and support for industry-leading Virtual Private Network (VPN) and Mobile Device Management (MDM) solutions to make working on the go secure. Samsung's SAFE enterprise mobility solutions provide flexibility and connectivity for mobile workforces, ensuring that users are able to operate more efficiently while on–the-move. Virtual Private Network (VPN) and Mobile Device Management (MDM) Support from Industry-Leading Solutions Providers – supports industry-standard VPN protocols to help users efficiently tap into VPN networks and MDM capabilities that allow IT departments to effectively safeguard employees’ mobile devices and corporate data. On Device Encryption –SAFE helps prevent unauthorized access to mobile data by leveraging the AES 256-bit encryption standard, encrypting all data, including app-specific internal data and internal/external memory. 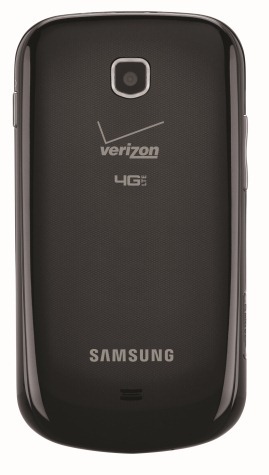 · The Samsung Galaxy Stellar will be available in Verizon Wireless Communications Stores and online at www.verizonwireless.com starting Sept. 6 for free after a $50 mail-in rebate with a new two-year customer agreement. Customers receive the rebate in the form of a debit card; upon receipt, customers may use the card as cash anywhere debit cards are accepted. · For additional information on Verizon Wireless products and services, visit a Verizon Wireless Communications Store, call 1-800-2 JOIN IN or go towww.verizonwireless.com.